Water can drop below its freezing point and still remain liquid, but scientists haven't figured out why. It’s a basic property of matter: Water goes from a liquid to a solid — ice — when the temperature drops below freezing, or 32 degrees Fahrenheit. But science, of course, likes to bend the rules. Enter supercool water, where water’s molecules can be forced to continue moving in its liquid state far beyond the point it has any business doing so, at least in the natural world. What’s puzzled scientists is that we know we can manipulate water this way, but we don’t quite know why or how. 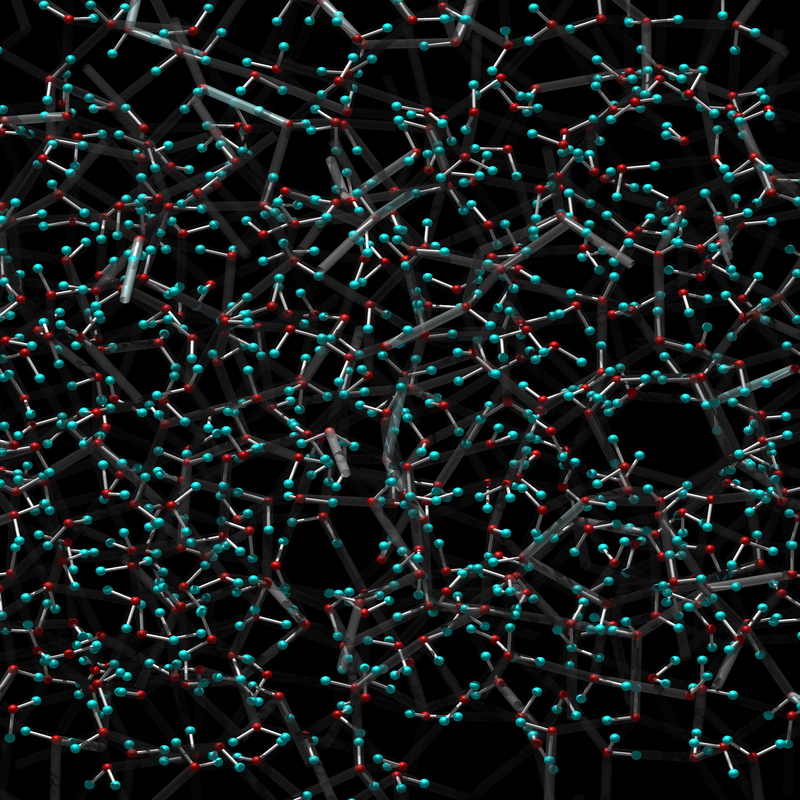 Scientists from the Roma Tre University in Rome created a computer-based simulation to better observe how water molecules interact with each other — and with other molecules — when they’re in this supercooled state. In doing so, they expanded our knowledge on how the thermodynamic properties of water might differ in confinement — like a small lab sample — compared to when water is in its natural, free-flowing state. The research was published Tuesday in the Journal of Chemical Physics. Water contained within a silica pore. Water, like pretty much anything else, is easiest to observe when you can put a small amount of it under a microscope and hold it very still. The traditional method of studying supercooled water has been to confine it to a human-made pore a few nanometers across, making it just one or two orders of magnitude larger than the diameter of the water molecule itself. The worry is that this might produce a skewed result that wouldn’t actually represent how water molecules really move. So the researchers simulated the results of water molecules inside a silica pore and compared them to a previous study. By examining the samples at the same temperatures, they saw that the oxygen-oxygen, hydrogen-hydrogen, and oxygen-hydrogen structures maintained largely the same structures when confined — their thermodynamic and structural properties are closely related, and we can thus approach their respective calculation in much the same way. Now, other experimental physicists will be able to use this knowledge in their own future lab work. Gallo herself, along with her colleagues, plans to continue pushing forward the boundaries of our understanding of confined versus free supercooled water. We derive by computer simulation the radial distribution functions of water confined in a silica pore modeled to reproduce MCM-41. We perform the calculations in a range of temperature from ambient to deep supercooling for the subset of water molecules that resides in the inner shell (free water) by applying the excluded volume corrections. By comparing with bulk water we find that the first shell of the oxygen-oxygen and hydrogen-hydrogen radial distribution functions is less sharp and the first minimum fills in while the oxygen-hydrogen structure does not significantly change indicating that the free water keeps the hydrogen bond short range order. The two body excess entropy of supercooled water is calculated from the radial distribution functions. We connect the behavior of this function to the relaxation time of the same system already studied in previous simulations. We show that the two body entropy changes its behavior in coincidence with the crossover of the relaxation time from the Mode Coupling fragile to the strong Arrhenius regime. As for bulk water also in confinement the two body entropy has a strict connection with the dynamical relaxation.